magnolia, originally uploaded by DanielleQ. I planted this last week... I totally love Magnolias and they seem to grow very well in this area. I had a few once and planted them in three corners of the garden - one died straightaway, one hung on for quite awhile, and the one near the road was growing beautifully until it disappeared one day. Weirdness. I love this bud, all waiting and beauty. ooo its exquisite. I have a white and pink magnlia, and I totally neglect it, it has the worse soil and comes up with fine flowers every year! Yey to weirdness! 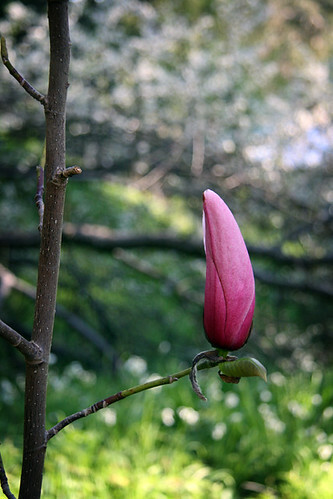 magnolia's are gorgeous. i love spring and blossoms, and new babies in the air - well not babies in the air....but u get the picture yeh? one of my workmates just had his magnolia tree 'flogged' - yes dissappeared from their front garden the other weeek in northcote - as it was starting to bloom - so angry, and i totally understand WHY! !